We consider a problem, in which we seek to solve the system of linear equations Ax = b, where A is an n by m real matrix, b a known real vector of dimension n by 1 and x an unknown real vector of dimension m by 1. Here, n > m because the state estimation problem is over-determined (more equations than unknowns). For a power system state estimation problem, matrix A is the measurement Jacobian. In the WLS normal equations formulation of the power system state estimation problem, ATA describes the gain matrix that is symmetrical positive definite (SPD) by structure, so the conjugate gradient (CG) method is applicable. Note that the gain matrix requires matrix-matrix multiplication of the measurement Jacobian A with its transpose, which is hidden by CGNR. Abstract. In order to achieve an effective reduction of greenhouse gas emissions, the future electrical distribution networks will need to accommodate higher amount of renewable energy based distributed generation such as Wind Turbines. This will require a re-evaluation and most likely a revision of traditional me­thodologies, so that they can be used for the planning and management of future electrical distribution networks. Such networks evolve from the current passive systems to active networks and smart grids, managed through systems based on Information Communication Technology. An alternative topology based on the FCM converter is the SM converter which stacks two FCM converters together; the upper stack is switched only when a positive output is required and the lower stack is switched only when a negative output is required [31-33]. 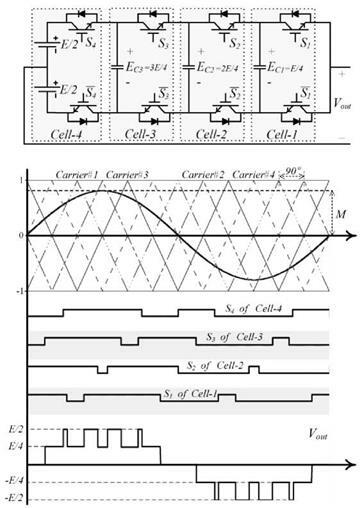 A 2x n – cell SM converter, as shown in Fig. 6, is com­posed of 4n switches forming 2n-commutation cells controlled with equal duty cycles, 2n – 2 flying capacitors with the same capacitance and different dc rating voltages equal to E/2n, 2E/2n, …, (n- 1)E/2n. As a result, the electrical stress on each switch is reduced and more equally distributed, so that each switch must support E / 2n volts . In this problem, constraints are divided into three groups of operational con­straints, environmental constraints, and battery constraints. These constraints are respectively defined in the following sections. The hybrid optimization algorithm was applied on the above-described distribu­tion system. It is assumed that WTs of three different capacities are chosen by the WT de­velopers. These capacities are 225 kW, 660 kW and 900 kW. Maximum three WTs of each type are allowed at a given location. This re­quirement may be set by the available land for building WTs. For another distribu­tion network with a different load level, WTs with different capacities may be considered. Consequently, GA is used to search for the optimal number of WTs of each type at the candidate locations. It is also assumed that the power factor is the same for all WTs connected to the same bus. where kh is the resonant gain for the resonant peak adjustment. As discussed, two controllers (feedback controller for FC and inverter controller) are constructed using the equations discussed before. These controller are constructed to­gether because the PI feedback controller requires an AC feedback voltage from the inverter to calculate the DC feedback current. Both the inverter and fuel cell control­ler must then run together. 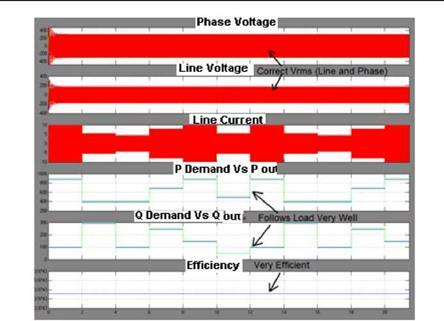 In this test, the simulation will be run with a static and dynamic load demand and the performance of the FC system is discussed.